ISLAMABAD, October 7: The Patron-in-Chief of Supreme Shia Ulema Board Quaid-i-Millat Jafariya Agha Syed Hamid Ali Shah Moosavi has said that there is no harm in initiating dialogue with extremists to root out terrorism from the country and restore peace because it is a historic fact that wars always culminate in dialogue. The rulers should talk with the extremists and India like a lion and not in a submissive manner. We had said at the beginning of the terrorism that Taliban should not play the role of oppressors; the dream of restoring a durable peace in the country could not come true without handling the banned groups with an iron hand. In the light of the saying of Murtaza (A.S.) we are in the habit of opposing every oppressor and supporting every oppressed. Case against Drone attacks may be filed in the International Court of Justice. The statements of the Indian Prime Minister have made the Aman Ki Asha and bid to better relations suspicious. We guarantee that all occupied Muslim areas can be achieved if the dilapidated shrines of forefathers of the Rasool (SAAW), Aal-e-Rasool (A.S.) and Ashab (R.A.) are restored with dignity otherwise the whole Muslim Ummah would confront more problems. We are not protectors of Azadari rather it is Azadari that provides guarantee to us, Sharait and Shi’ite. The government has been apprised of taking necessary and practical steps including setting up of Muharram Control Rooms and the policy in connection with the oncoming Muharramul Haram will be announced through a Press conference. These views were expressed by him while delivering his presidential address at the two-day high level meeting of Tehreek Nafaz Fiqh-e-Jafariya Pakistan at the headquarters of the Maktab-e-Tashih here on Sunday. Delegates from Federal capital Islamabad, all the four provinces, Azad Kashmir, Gilgit-Baltistan and abroad attended the meeting. 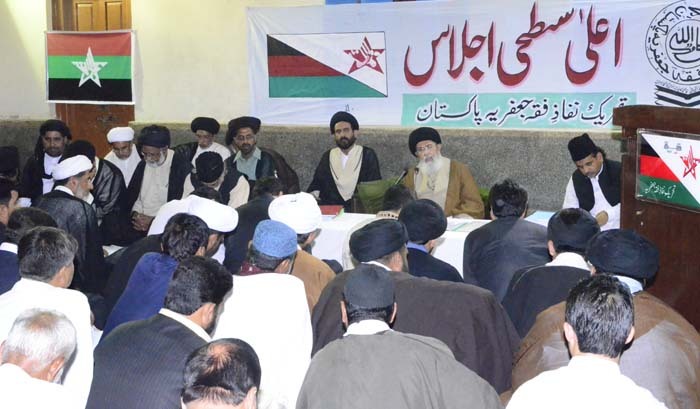 Agha Moosavi said that the purpose of heinous game of terrorism being played in different Muslim States including Pakistan to divert the attention of the Muslim Ummah from real issues. He said the international powers desires to give this heinous game of murder and arson a Maktabi, groupism, lingual and sectarian colour to as to fulfill the international agenda while we still follow our long-standing point of view that a terrorist keeps no religion, Maktab or a country, he is only a terrorist and should only be seen and tackled in that context. He said when a dictator announced to turn the motherland into a Maktabi State in 1979, the TNFJ was formed in that reaction because this country is the fruit of combined sacrifices and joint struggle of both the recognised schools of thought therefore the country could not be turned into a sectarian State in our presence. As a result of our peaceful policy and campaign, he added, the official religion of the State is Islam under the Article 2 of the Constitution and not any sect the explanation of which is left to Sunnis and Shias according to their fiqh. The TNFJ chief said that thousands of Sunnis and Shias came out for a peaceful agitation from the Hussaini Mohaz against the amendment made by the Governor Punjab in the Article 30 (3) of the Police Act as a result of which May 21, 1985 peace agreement was signed that even today guarantees independently taking out all religious processions including Azadari and Eid-i-Milad processions. He said that when anti-State elements could not bear the exemplary Sunni-Shia unity they introduced Private Shariat Bill in the Senate which we rejected by saying that there is no need of any such Bill in the presence of 1973 Constitution. He said there is need to tighten the noose around extremist terrorist groups banned officially and to impose ban on their activities they are performing with new name so as to make the dream of restoring durable peace in the country true. Agha Moosavi said there is nothing in Islam except Zarb-e-Yadullahi and Sajda-e-Shabbiri which are the other names of Wila-e-Ali and Aza-e-Hussain and these are our standards of friendship and enmity. He said we would like to make it clear that neither our forefathers bargained on the basic beliefs and ideologies of Islam nor we or our future generations are going to do so. He said the address of the Prime Minister in the United Nations General Assembly and his meeting with his Indian counterpart could not be made result-oriented unless Drone attacks and Indian-sponsored terrorism are stopped. The Quaid-i-Millat Jafariya Agha Syed Hamid Ali Shah Moosavi termed the government steps after the Supreme Court’s suo motto in withdrawing the notification of increasing electricity rates a good step. He said the rates of items of daily use are already high and are becoming unbearable for the people, therefore, the government should take practical steps to get the people already stung by the terrorism rid of price hike and fight out poverty.